When I was a kid, my family and I would always do arts and crafts to prepare for holidays or a change in seasons. One of my favorite times of year was the beginning of winter, just for this reason! I loved making snowflakes and hanging them in the window. Of course, when I got older things changed. People just don’t appreciate cut out snowflakes when you’re 23 instead of 3. I decided that this year would change that. 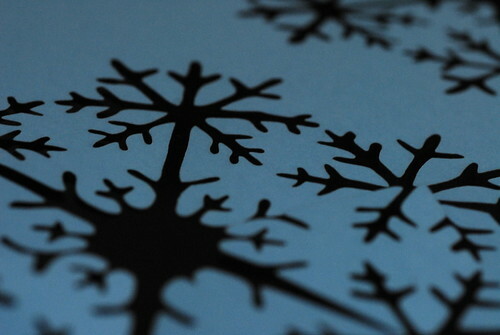 I made some amazing snowflakes on the laser cutter at Metrix! The first style I made was inspired by the lights that have recently been hung on Broadway, the street that Metrix is on. they’re in the shape of a snowflake, but they’re made up of small, white lights. I really love how soft and warm the lights make the sharp corners of the snowflake look. These lights get put up every year, and I never get tired of looking at them. I started by creating the basic shape of a star. I then added a line coming from each point, and made it branch off into a couple of more lines. Then I added circles to make the star look like the lights outside. I thought the ultimate effect was pretty neat (if I do say so myself) and didn’t take very long to make. Using basic shapes like stars, circles and triangles will get you a lot of really neat looking snowflakes. I wanted my next snowflake to be themed on something Metrix does well- electronics. 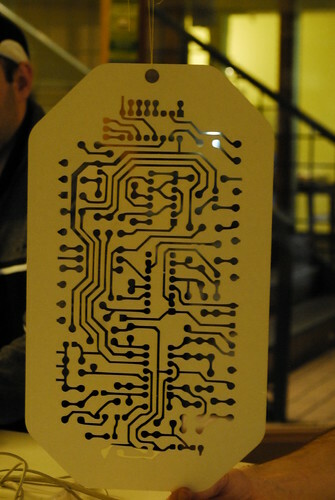 I thought that the shapes seen on circuit boards were intricate and beautiful; perfect for hanging in a window. My original idea was to create a six pointed snowflake, with each point containing a circuit inside. I wasn’t sure if the paper could handle being cut up that much though, so I modified my idea. Each circuit board would be cut out on a different piece of paper. They could then be hung from each other going down, or hung on a shared string horizontally. I can definitely see these hung merrily in a window, or even used as wall art. Finally, I wanted to make something a bit more traditional. I found some images online to gain inspiration from. Creative Commons images are a good place to start if you want pictures to directly copy to make your personal snowflakes. The laser is super accurate. It was able to cut my snowflakes out down to the tiniest curve. It looks like something I bought in a store, but I made them myself! 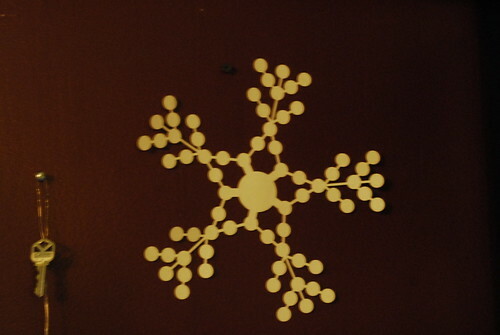 After I was done, I hung my snowflakes on the wall at Metrix to give inspiration to anyone else in a wintery mood. I think I might cut some more the next time I’m in and make a snowflake mobile with various sizes of flakes. Or maybe string up the small holiday lights I have in my house and tape the paper flakes in front of them, causing them to glow. Or, how cool would these be cut in wood? I could have winter coasters for my drinks! There’s all sorts of fun things to do with pretty shapes and a laser cutter.Even the negative space left in the paper after I cut my flakes out is beautiful. I wonder what I could turn that into. The paper that I used was a construction paper I found at an art store. It was able to keep its shape pretty well, even with so many holes because of its thickness. I’m sure something like card stock would work even better. Thick felt would look good too, and feel soft. Of course Metrix also has wood to cut out on. Snowflakes made of wood would last a long time, and could even be painted, if that was another craft you wanted to try out. 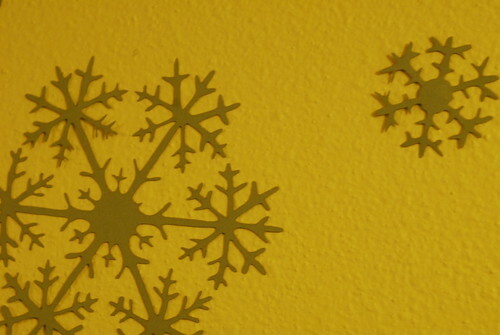 If you’re curious how you can make your own snowflakes, or anything else you can cut on a laser cutter, I’m teaching a workshop this Sunday all about learning to use Inkscape for laser cutting. Information can be found here. Come to the class, and see what kind of memories you can create. Of course, Metrix still has scissors for all you traditionalists out there.